What is the first foreign country you encounter when traveling due south from Washington's Stuart Island State Park? The better known form of this question uses Detroit, but the answer is the same. Canada. The San Juan Islands come quite close to Vancouver Island, due to boundary negotiations between Great Britain and the United States. The same negotiations resulted in Point Roberts being included in the U.S. with no land link to the rest of the country. This part of Washington is tied to Canada by transportation links as well as history, with ferry service connecting islands to the Victoria. 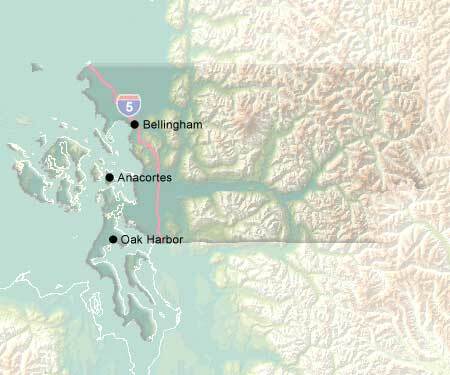 The major mainland cities are Bellingham and Mount Vernon. Mount Baker towers to the east.